This has been a very hard-working but an effective and award-winning year for our mission. Thank you for being with us! We are sincerely grateful for your help, and your prayers. May God bless and protect you into the new year! top TURN! TURN! TURN! 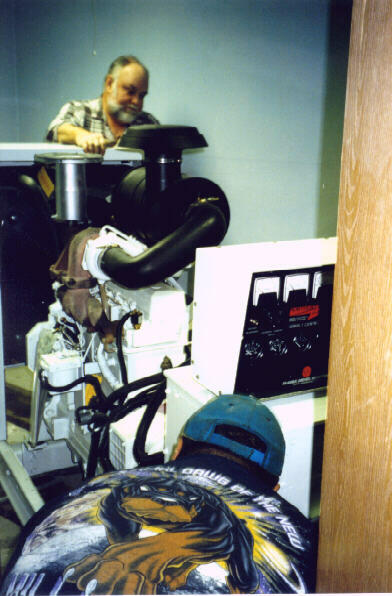 (left) Engineer Les Brown and three helpers (two of them not visible here) maneuver our new studio generator through a door and into position. 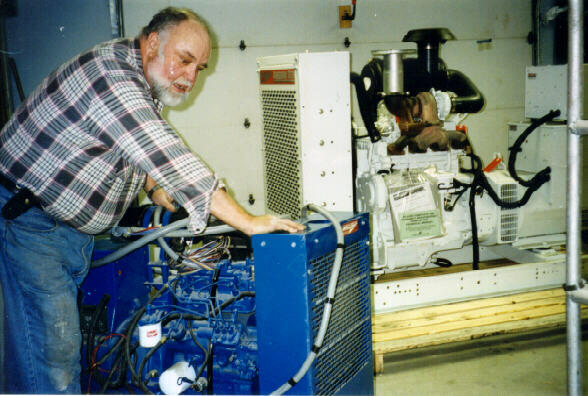 At 2,456 pounds, the 55,000 Watt generator required an hour of labor for its final fifty feet. It was purchased thanks to two large contributions and hundreds of smaller ones. Thank you! At press time, the generator had been wired, but had not yet been connected to its fuel line. By the time you read this, the new unit should be installed, tested, and already on duty, ready to automatically power the KNOM studio when the regular electric lines fail. INSPIRATIONAL SPOT: Decisions can take you away from God�s will, but never out of His reach. RE-TREAT! It�s always a treat to spend time with our spiritual director, Father Mark Hoelsken, SJ. Father Mark devotes most of his time in the remote villages of Chefornak (cheh-FOR-nuk) and Newtok (NEW-tahk). In November, he flew to Nome to meet with all of the KNOM staff and conduct a spiritual retreat for the volunteers. WE�RE READY: All of the KNOM systems, from the transmitter control to the telephones, have been tested. Our oldest computer needed replacement, and a couple of others needed upgrades to their software. We believe that our station is completely ready for the year 2000. However, since we do greatly depend upon computers, manager Tom Busch, program director Ric Schmidt and engineer Les Brown expect to spend December 31st at the station, ready to step in if there is a problem. 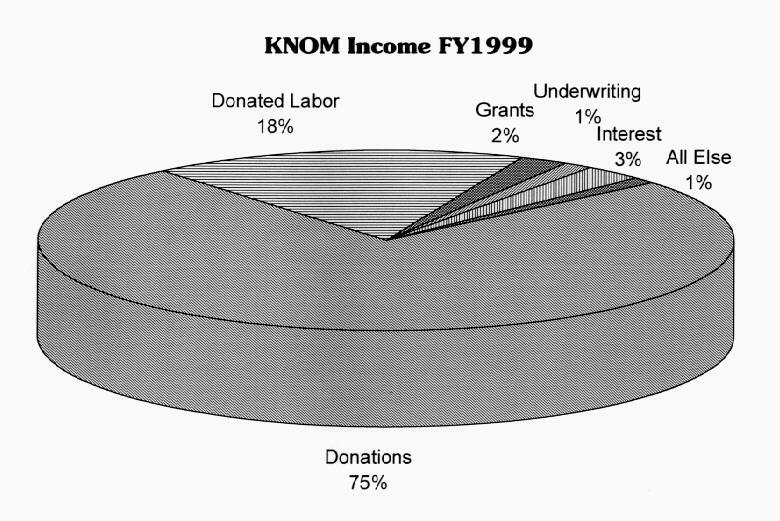 For the year ending June 30, 1999, KNOM�s total income was $751,000. This includes donations given to capital and special projects. Our operating expenses, not including those projects, was $721,735. In order to present the most realistic view of our total operation, we have added �Donated Labor� to the charts on this page. This is the difference between KNOM�s level of compensation to staff, and the amount which KNOM would have to pay if we did not have volunteers, and if salaried staff were paid marketplace salaries. We estimate this at $160,000, which represents the value of contributions by the KNOM staff. If you�d like to receive a copy of KNOM�s complete income/expense statement, please contact general manager Tom Busch and he will be delighted to send it to you. In fact, Tom will be happy to answer any questions whatever. Please write him, or e-mail busch@knom.org. HISTORICAL COMPARISON: 20 years ago, KNOM had only one permanent staff member on a 20% salary. There were 12 radio volunteers and 5 volunteer nurses, who donated their incomes to the station. Most of the staff were brand new every year. In 1979, KNOM cost $285,319. That�s the equivalent of about $705,000 today, about $120,000 of which was spent on heating fuel and building repair. KNOM was on the air 18 hours a day at 10,000 Watts, dropping to 5,000 at night. 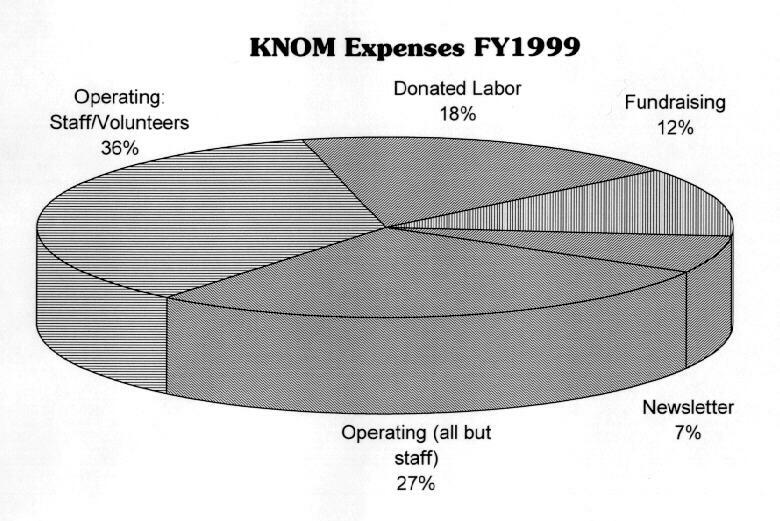 During 1999, KNOM employed 4 full-time people and 3 part-time, paid from 70% to 80% of comparable salaries elsewhere, and we had 5 full-time volunteers. Our fuel and repair costs were $20,362. KNOM is on the air 24 hours a day, at 25,000 Watts, dropping to 14,000 at night. One reason why we are able to maintain a larger salaried staff is the high efficiencies of our present buildings and our equipment. Another is that our staff share 126 years of radio experience! However, it is you who makes our work possible. We deeply appreciate your interest and faithful support. FEBRUARY 5: Hurray! KNOM celebrated the completion of one year at our new 25,000 Watt power level. The following week, Les Brown finished KNOM�s upstairs dubbing station. Outfitted as a mini-studio, but without soundproofing, it�s a perfect spot for dubbing Mass broadcasts, editing interviews, etc. Like KNOM�s two full production studios, the dubbing station now sees six to ten hours of hard use every day. 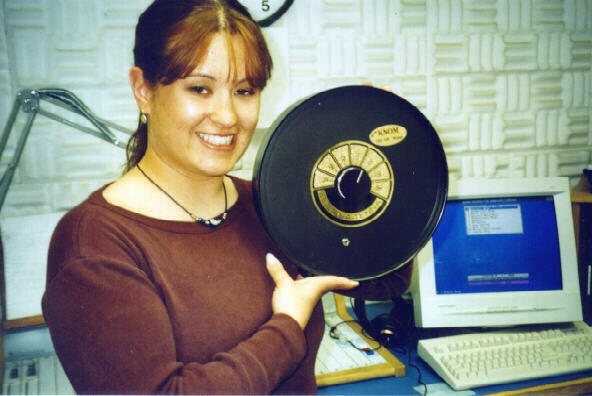 MARCH: Already in 1999, KNOM had broadcast 41 major public affairs programs, discussing Native Alaskan legends, emergency medical services, the Alaska legislature, and dozens of other topics. KNOM had already aired 8,500 inspirational spots and 8,500 educational ones, plus countless hours of news, daily Rosary, Mass, and many, many special programs. At the end of March, we produced live gavel-to-gavel coverage of an historic Alaska Board of Fisheries meeting in Nome, discussing the catastrophic loss of salmon in the region. MAY: (left) Volunteer Vicki Muzik posed with one of 746 antenna boosters which we distributed among our listeners. This massive distribution was made possible by three large contributions and many smaller ones. In villages, the boosters make a huge improvement to the KNOM signal. Thanks to them, many families who were without KNOM last year at this time can now hear us loud and clear. Because of this project, there are now antenna boosters in 18% of village homes for a radius of 200 miles. Isn�t that amazing? Thank you to everyone who gave toward this worthy and successful effort! JULY 21-22: Tower contractor Rod Ewing inspected and plumbed the 236-foot KNOM tower, then applied a fresh coat of aviation orange and white paint. Sunlight, rain, snow and wind slowly dull the bright paint, which needs recoating about every seven years. AUGUST 16th was the second anniversary of the installation of our Nautel ND-25 transmitter. In those two years, the transmitter worked without complaint, and without a single component failure. One reason for this incredible record is KNOM engineer Les Brown�s meticulous program of preventive maintenance. 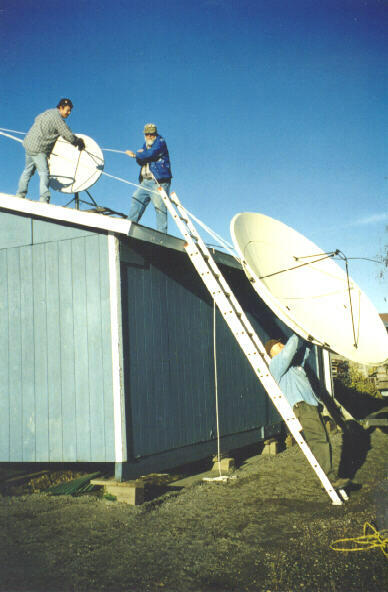 SEPTEMBER: (left) Les Brown, at center, and two Associated Press technicians hoist a new satellite dish to the roof of the cold storage building behind our studios. In the second week of September, the three had to wait every morning for the night�s frost to melt off the roof. Nome is so far north and west that satellite experts did not expect the new AP system to work here, but to everyone�s delight and surprise, it�s been working fine. The dish provides AP �teletype� service, as well as AP Radio Network�s hourly newscasts, and network coverage of breaking news stories. SEPTEMBER 2nd: Alaska Governor Tony Knowles hosted a live call-in program from the KNOM studios, to discuss the disasterous fishing season with KNOM listeners. OCTOBER: Many of KNOM�s village listeners cannot afford the high air fare to Anchorage, to attend the state�s annual gathering of Alaska Natives from throughout the state. That�s okay, as KNOM was able to give everyone a front-row seat. Throughout the four-day meeting, KNOM devoted more than 24-1/2 hours to live coverage of the great event. In addition, news director Paul Korchin produced 28 news stories which aired while the convention was in recess. ANOTHER ANGEL: (left) For the fourth year in a row, KNOM was honored with one of the highest honors in broadcasting, the Gabriel �Radio Station of the Year� Award. Incredibly, KNOM has been honored with the Gabriel seven times. 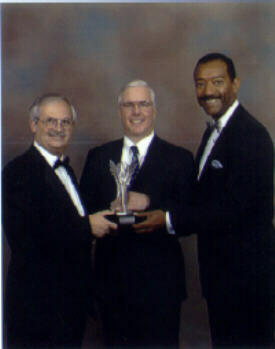 At the the Hotel Monte Carlo in Las Vegas October 16th, manager Tom accepted the award from Unda-USA president Frank Morock (left) and the ceremony�s host, WGN-TV news anchor Robert H. Jordan. In his brief speech, Tom acknowledged the many donors to our mission. �We stand on their strong shoulders,� he sait. NOVEMBER: Winter came late to Nome this year. Although temperatures had dropped almost to zero many nights, the season had been extremely dry. Veterans Day brought Nome�s first major snowfall, with drifts that accumulated to knee-depth in places. Thanks to a couple of large donations, as well as sale of the little generator, we were able to replace it with a unit five times its size. Why the need for higher power? It�s partly because of our increasing reliance on computers. Last year, we discovered that their Uninterruptable Power Supplies do not work properly under diesel power unless the generator is oversized. Our little unit was straining, right at its useable limit. As you can see, rolling even a small generator on pipes involves a lot of elbow grease! The new rig is in the background..
INSPIRATIONAL SPOT: Life is like a long stretch of land. There are hills of happiness, flat areas of routine, obstacles like rivers and lakes, and valleys of frustration and failure. Keep working toward those summits by living each day with hope and joy. Thank you again for your prayers and your generous contributions. Although we realize that technically, the start of the new millenium is still a year away, it�s always fun to watch the odometer roll over zeroes. We pray that your New Year will be safe and enjoyable, and the Lord will be with you in a special way as we enter the year 2000 together. God bless you!